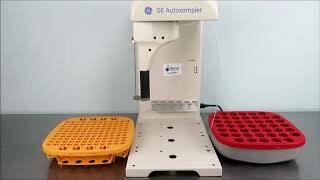 The GE Sievers 900 TOC Autosampler provides automated accuracy and high-volume processing in a compact, easy to place footprint. The Sievers Autosampler is a great way to boost productivity when partnered with a M9 TOC Analyzer for the best in flexibility, throughput and automation. This autosampler helps optimize your workflow in TOC measurement with fast analysis time, and over 24 hours of unattended automation. This injector can load up to 120 sample 17-mL vials or 35-mL test tubes, or 63 40-mL (or 60 mL) vials in one protocol, with a built-in emergency rack that holds five 40 mL vials for measuring high purity samples. The GE Sievers 900 TOC Autosampler moves quickly and precisely in 3 axes, giving you the flexibility of any sequence of samples you need, regardless of vial position. This random access autosampler is compact in size, taking up minimal bench space at just under a foot wide. This GE Sievers 900 TOC Autosampler has been fully inspected and is performing to expectations. All of our lab equipment comes backed with our standard warranty. Should you have any questions, please don't hesitate to contact us.